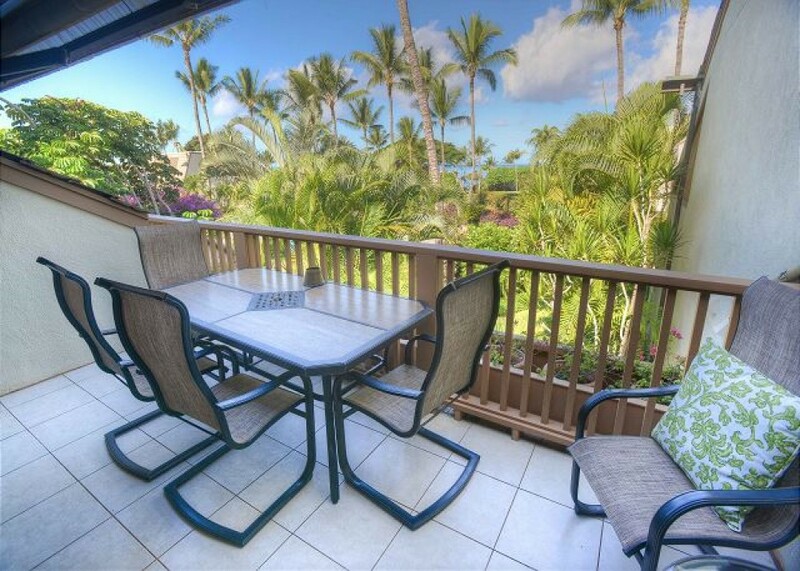 The owners of this two-bedroom Maui Kamaole condo take great care to ensure that guests feel at home in this beautifully renovated space. With major upgrades throughout, we're sure you'll agree that this is one of the best places to stay in South Maui. The common areas, living room and kitchen, have all had major upgrades, and new furnishings installed. The owners have worked hard to decorate in an elegant, Hawaiian style that is subtle and tasteful. New stone counter tops and backsplash and high-end stainless steel appliances are highlights of the kitchen, fully stocked with all necessary cookware and utensils to prepare and serve meals during your stay. A breakfast bar with three stools, a dining area that comfortably seats four, and a lanai dining table that can seat up to six give guests plenty of options. Living room furniture is new and luxurious, and includes a pull-out queen sofa sleeper for accompanying children or the occasional overnight guest. The electronics include a new flat-screen HD SMART television and Blu-Ray player for guest entertainment or the occasional movie night. Each bedroom features a high-end King bed, with all linens and bedding provided. Upstairs, in the loft, shutters close off the space from the living room below, creating a completely private space. The attached bathroom features a very large walk in shower, double vanity, and beautiful tile work. Downstairs, the guest bedroom has convenient access to a hallway guest bathroom with a tub/shower combination. Each bedroom features its own A/C unit, HD television, iPod docking station, and sliding doors to small balconies (french balcony in the guest bedroom, reading nook in the master bedroom). In beautiful South Kihei, the 23-acre Maui Kamaole resort is perfect for your vacation to Maui. With meticulously manicured landscaping, spectacular tropical views, and luxurious resort amenities, Maui Kamaole is sure to help you relax and rejuvenate. There are two pools, multiple hot tubs, tennis facilities, and barbecue area for your convenience. We provide our guests with beach chairs, a beach umbrella, and several beach towels. This wonderful resort is across from one of South Maui's world-famous beaches, Kamaole Beach III. You'll be steps away from snorkeling, swimming, and strolls in the soft white sand. This is a popular resort destination for travelers around the world! 20% down to hold a reservation. Balance due 45 days before check-in, Holiday and peak season rates and required lengths of stay may be different than quoted above. Credit cards, checks and money orders are accepted. Minimum stay varies among the rental units. Maui Kamaole charges a one-time $10 resort fee. Pricing on Tripz.com may not include additional resort fees or processing fees. Contact management for a comprehensive pricing quote.